When Apple Inc.'s iPhone makes its long-awaited debut in Canada on July 11, it will be the new-and-improved version. When Apple Inc.'s iPhone makes its long-awaited debut in Canada on July 11, it will be the new and improved version. The company announced on Monday the faster and cheaper iPhone — with new capabilities, including GPS tracking — will be sold in 70 countries this year, including Canada. The device will run on Rogers Communications Inc.'s third-generation (3G) network, and be sold in Apple and Rogers stores. "Rogers has a long history of bringing Canadians the very best in wireless services, networks and handset innovations," Rogers Wireless president Rob Bruce said in a statement. "With iPhone 3G, we will provide our customers with an amazing mobile experience over Canada’s fastest wireless network." Apple Inc. plans to introduce the new and improved device to the 22 biggest countries starting on July 11, CEO Steve Jobs told a crowd of developers in San Francisco on Monday. The maximum price on the new eight-gigabyte iPhone, which will run on faster third-generation or 3G cellphone networks, will be $199 US, he said. The new price, down from $399 US, likely means the iPhone will be subsidized, either by Apple or phone carriers, and include a term contract. A 16GB version will also be available for $299 US. A spokesperson for Rogers confirmed the prices but did not specify what length of contract consumers would have to sign. Apple and Rogers also said they would announce monthly pricing and rate plans at a later date. Following the announcement, AT&T Inc., the iPhone's exclusive carrier in the United States, said it was scrapping its revenue-sharing arrangement with Apple in light of the new subsidized model. AT&T had been paying Apple an estimated $10 US to $15 US a month per subscriber. The carrier is also raising subscriber rates to $69.99 US for a basic plan with unlimited data, an increase of $10 US. AT&T is offering the devices at $199 US and $299 US in conjunction with a two-year contract. Apple also did not disclose whether its deal in Canada with Rogers is exclusive, as it is with AT&T in the United States. Rogers is currently the only Canadian carrier with a network that is compatible with the iPhone, but that field will expand early next year as new cellphone carriers are expected to begin operations. Jobs was effusive in his praise for the updated iPhone, which will also feature the same sort of instantaneous e-mail that has made Research In Motion Ltd.'s BlackBerry such a success. 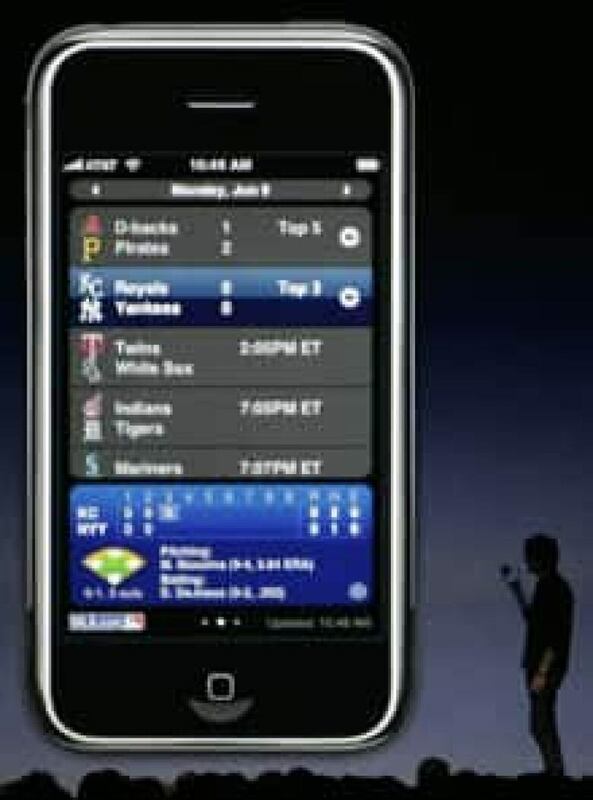 "Just like the first iPhone, this new iPhone 3G is one of the most amazing products I've ever had the privilege to be associated with," he said at the Apple Worldwide Developer Conference. The company has sold six million iPhones since it launched a year ago, and it has set a goal of 10 million by the end of this year. Jobs also showed off a number of new applications that have been developed for the iPhone, which will also work on the company's iPod Touch music player. These included a number of video games, such as Sega's Super Monkey Ball, as well as a mobile version of eBay that allows users to bid on auction items while on the move. The new online store, where customers can buy applications for the iPhone and iPod Touch, will be available at the same time as the updated phone is released. Jobs said more than 25,000 developers had paid to create applications for the iPhone, but Apple admitted only 4,000. About 35 per cent of Fortune 500 companies participated in the program, including the top five banks and securities firms, he said. Jobs also promised to expand push e-mail beyond corporate clients with a new web-based service called MobileMe. Users of the iPhone can subscribe to the service, which will replace Apple's .Mac network, for $99 US a year. The updated iPhone will have improved sound quality and better battery life, giving 300 standby hours, five hours talk time, seven hours of video or 24 hours of audio, the company said. Its speed improvements will allow web pages to load in about 21 seconds, versus approximately 59 seconds on current iPhones. That kind of performance is close to Wi-Fi speeds, Jobs said, where a website loads in 17 seconds. "It's amazingly zippy," he said.